Just hire me in Dunder Mifflin Accounting & make me a purser! 90210: How? What? Really? Is That Possible? 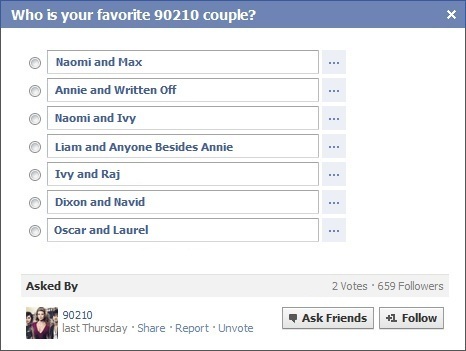 There is currently a question posted on the 90210 Facebook page asking fans to vote for their favorite couple on the show. 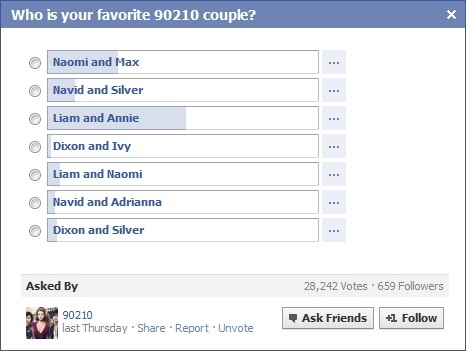 Shockingly enough, Liam & Annie have a commanding lead! I wasn’t aware people actually liked Annie them together (I know I don’t)! Thankfully, Naomi & Max are a solid second. Nothing would make me happier than seeing Josh Zuckerman be made a series regular. Nothing besides better choices for the above question that is! These are what our options should be! Laughed way too hysterically at all of these. NAOMI AND IVY! DIXON AND NAVID! OSCAR AND LAUREL! LOLOLOLOL.